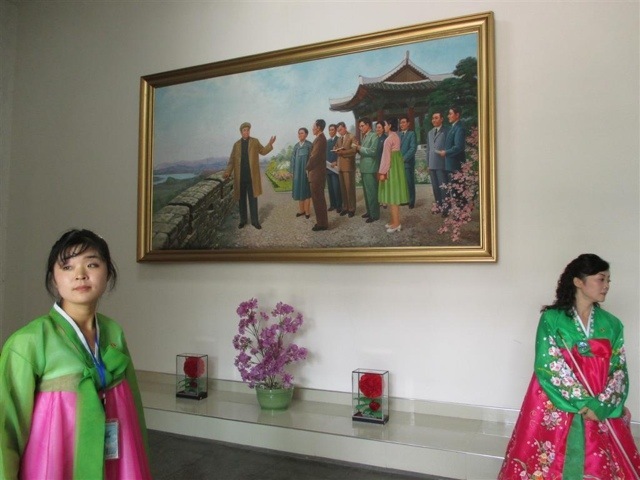 The one day tour of the border city of Sinuiju, North Korea, focuses on the achievements, grandeur and kindness of the great leaders of the country, and how evil the enemies are (US and Japan). The visit goes around a detailed account of number of times and exact locations of great leaders visits and the country’s heroic defense from the outside. 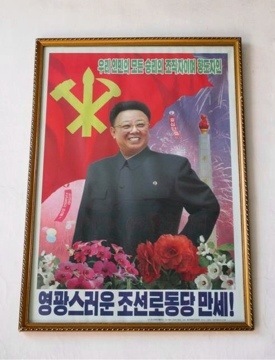 Most of the pictures in a local museum portrait a Kim Il-sung smiling, victorious, inspiring. In the main square tourists are invited to offer flowers to his statue and bow in front of it showing respect (although one sneaky tourist from the group didn’t buy flowers) . Kim Il-sung figure has been inflated to the point that the country changed the account of the years to the so called Juche calendar: year one was his birth, today we are only in year 102. What is striking is that ordinary people seem afraid to do a reality check and see how poor has the country become and how much it is lagging from the rest of the world. The light of the official propaganda blinds them from seeing the truth, remembering how it all was in the past or comparing with the litte they see from other countries (some tourists, traders and China’s skyline at the other side of the border). But where did things get so wrong? 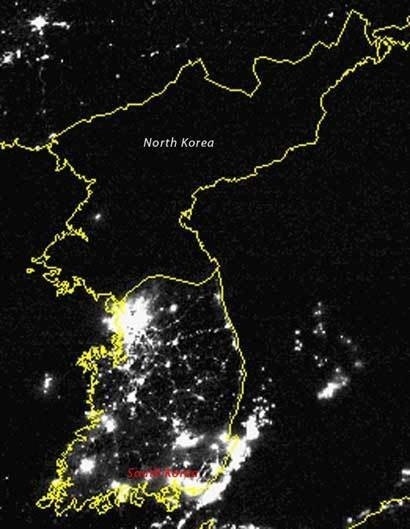 North Korea is not a developing country, North Korea is a country which was developed and failed. And this dates back to the end of WW2, the Korean war and the the fall of the Soviet Union. Being a closed country, it depended a lot on his allies. The lack of electricity that the country couldn’t produce hampered its development. 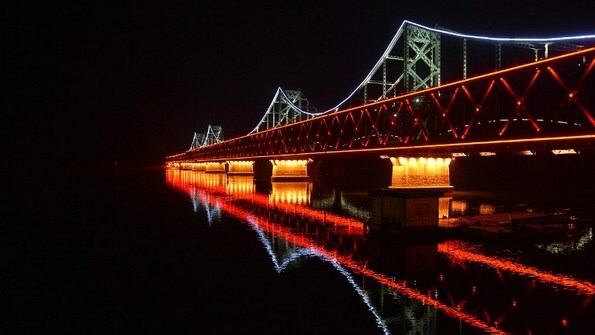 North Korea is now a black spot in the world, which becomes more apparent at night, from the sky or from the bridge Dandong-Sinuiju, starting from flashy China and getting lost in the darkness. Walking around Sinuiju is coming back in time. The country seems to have fallen back into the medieval ages, by a close look at life of ordinary people in the countryside. At least, long before the industrial revolution. The only industry that seems to remain in the area is the military. Where is the hope then for bringing North Korea and its people back to the 21st century? 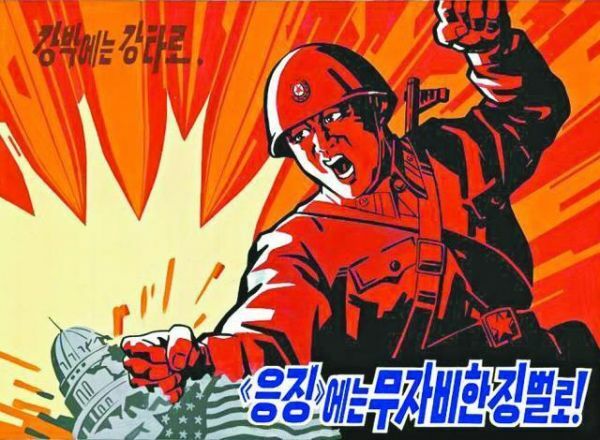 An intervention from the US and the potential destabilization of the Korean Peninsula and the whole region? A progressive peace treaty between the two Koreas? Some wrecks in the governing elite or a figure committed to open the county and save its people? maybe a cool down in the relationship with China that makes the ruling government to try to escape from complete isolation? In the Chinese city of Dandong, at the other side of the border, one can witness what may be a key for the answer. 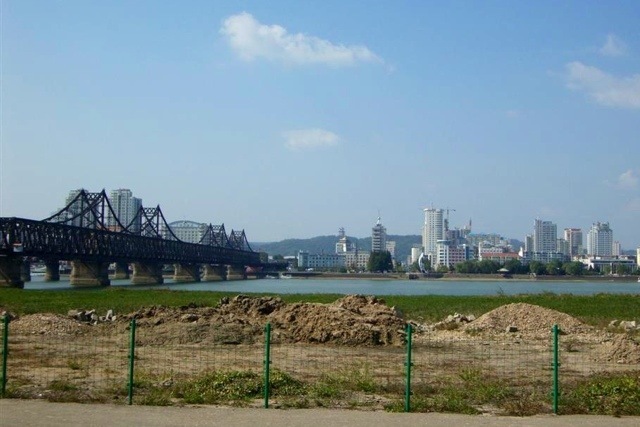 Trade (legal and illegal) flourish between the two cities, and a new class of North Korean businessmen are accumulating wealth and influence that may pose a threat to the totalitarian government. Being at Sinuiju, North Korea, on year 102, the future of the country still seems as dark as the satellite image of the country at night.